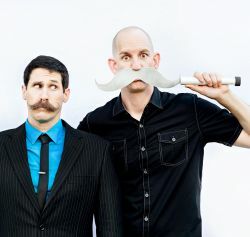 Rootberry is Jonathan Root and Bill Berry, a comedy stunt duo with 3 Guinness World Records and 5 World Championships, it’s no wonder the San Diego Union Tribune said “Possibly the best variety act on the planet”. Since 1998, Rootberry has devoted all of their time, effort, and creative energy into building the best hour-long comedy variety show they could dream up. Their motto is “We love what we do, and so will you”. The performance itself is somewhat difficult to describe but Reno Magazine calls it “The Blueman Group meets X-Games”. Prepare for an action-packed comedy stunt show with a little juggling, a little sword swallowing, and a lot of surprises. This is their first time at Moisture Festival and we think that they’re going to fit right in.